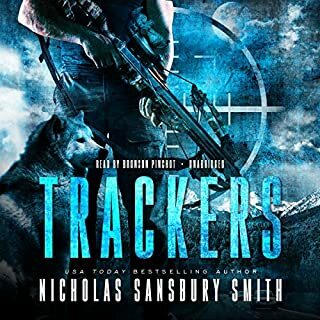 Trackers is a book (and a series) set in a world where North Korea has taken down most of the United States with a “perfectly strategized” atomic bomb attack – high in the atmosphere – aka setting off an EMP. It is also a book about a serial killer. That makes this one of the most unique books I’ve read in… well either genre. That’s what, in my opinion, made this one such a great story. 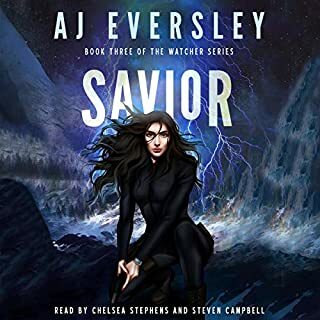 It wasn’t just another EMP/Post-Apocalyptic book where everything seems to work out for the good guys and all the bad guys seem to just do things with no good reason. Smith was able to write a story that was both believable but downright terrifying. Either one of the two stories that are interwoven would have scared me, but the combination of the two is what really got to me. The lead up to and the eventual attack by NK feels like it is torn right out of the headlines. Smith does a fantastic job writing Political Fiction without actually making it too political. I love that there were good and bad guys in the political part of the story – but we never hear or find out what side of the fence they sit on. We’re able to pick and choose what we want to believe and then color the story our way. It’s a gutsy move as an author, but I think it absolutely pays off. The serial killer/Native American folklore part of Trackers is what really sets this book apart from others in this genre. Smith was able to make a believable serial killer and one who was able to torment and terrify the townspeople of Estes Park. Really talking much more about this part of the book would spoil it, so just know you’re in for a totally unique twist. Raven is easily one of the most unique and interesting characters I’ve ever read. Smith does a great job including some Native American lore along with what people living on reservations would deal with (especially “half-blood’s” like Raven). He was a “troubled” kind of guy who had gotten in trouble with the police but ends up helping them out numerous times. Okay, so the only reason that this book lost .5. And if you’re reading this on any of the major sites (Audible, Goodreads, Amazon, etc.) it will get the 5 it deserves. Bronson Pinchot’s narration rubbed me the wrong way a few times. It was just times where a sentence would start off like this AND THEN GO INTO SOMEONE YELLING LIKE THIS (all while kinda sounding like you’re passing a kidney stone – aka through gritted teeth). It’s hard to describe and I almost feel guilty for pointing it out. 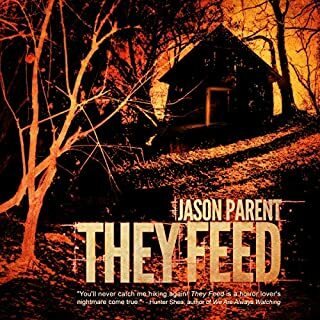 But, the overall narration and feel of this book were uneasy – and that was done on purpose. The world is almost ending and people are being attacked by a serial killer. It’s an uneasy book. Overall, a great start to a series that I’m definitely interested to see how it continues. I’m really intrigued by where Smith will take us next! I have a lot of Steven Konkoly titles in my TBR pile. I’m almost embarrassed to admit that I have more on my TBR than my actual read pile. But I kept hearing about this book. Numerous of the other authors that I follow were talking about how good this book was. I’m glad that I fell into peer pressure. The Rescue is the real deal. 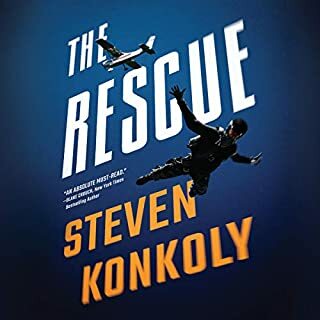 Konkoly is a fantastic Thriller author and The Rescue did not disappoint at all. Sometimes I feel like I’m spoiled with books. When I get a couple of back-to-back 5-star titles I start to feel this way – but The Rescue was the real deal. I enjoyed it from beginning to end and I was completely invested in each character (especially Decker). The Rescue introduces a slew of new things considering its book one in a new series. We’re introduced to Ryan Decker who reminded me a little bit of Tom Clancy’s Jack Ryan mixed with some Jason Bourne along with a few others sprinkled in there for good measure. We’re introduced to him only to find out that he’s been arrested and put away (and not told why until later in the book). The rest of the story is him trying, not only to exonerate himself but also trying to put the real bad guys behind bars (or in the ground) for killing his friends and family. Pretty much everyone else we meet is essential to the story but are also spoilers if I speak too much about them here. But know that there will be a kinda-sorta-beat-around-the-bush love interest and also a complete bad-A female who helps Decker out of some jams. You also have some old friends and some people “back from the dead”. I loved The Rescue and I had an absolute blast reading it. It’s one of the best thrillers I’ve read in 2019 and I cannot wait to see what else Konkoly has in store for us and Decker. 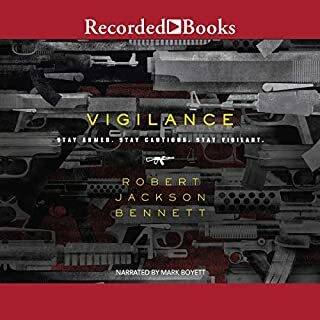 Vigilance tells the story of America’s favorite past-time – mass shootings. Reading this only weeks after the mass shooting in New Zealand made this feel even more poignant. The fact that Bennett was able to take politics basically out of Vigilance baffles me. There was a little backstory on the US and how China has basically taken over. He also goes into some detail about how all the smart and good people left for other countries, basically abandoning the US – but none of that dealt with political reasons. He turned a book that I would have bet a lot of money would have been political and made it into a book based on marketing instead. Absolutely brilliant. 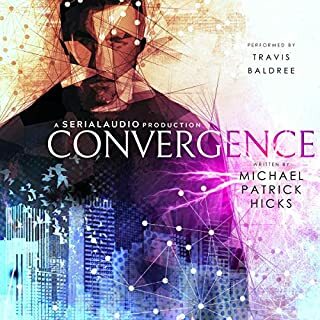 I hung on every word in this audiobook because it was presented in a way that I knew that they were all going to be important. Clocking in under 4 hours – I was hoping that Bennett could pull it off. Not only did he pull it off, he left me feeling completely hopeless and overwhelmed by the story he was able to tell in that time frame. This review has rambled a bit because I really don’t know what to fully say about it. It was a brilliant piece written at the perfect time in history. I hope that we learn from it instead of the Brave New World and 1984’s where we basically let some of it come true – even though we were warned about it. Overall, one of the most honest and real books I’ve ever read. A book that’ll definitely stay with me for a while. Sometimes when a series goes beyond three books what happens is that you start repeating ideas and even some of the snark and wittiness. That is not the case with book four of the Supervillainy Series. Phipps is at it again this time introducing a doppelganger in Gary aka Merciless The Supervillain WITH Mercy. The fact that this is where this book went cracked me up. Let alone add in the humor that Phipps adds (and Kafer nails in the narration). 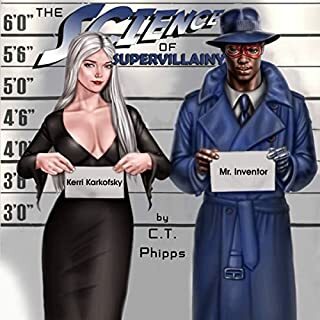 In my last review, I said that book four was my favorite but I might have to change my mind and say that the Science of Supervillainy is now my favorite. The dark and kind of moody feel to this book (without losing the charm, funny, and wit) really sets this one apart from the rest. We have now spent quite a bit of time with Gary and I didn’t think there would be any surprises or new shocking things but in each book (and for some reason especially in this one) he keeps surprising me. Character development four books in for the same main character is shocking to me (in a good way). I love that Gary/Merciless continues to grow and allows me to like him even more as the books go on. The addition of new characters, especially Gizmo also helped to make this my favorite so far. The reference to old school movies and the relationship really got me. Something I haven’t pointed out yet in a review is how well Phipps writes dialogue. I guess that because I didn’t notice (meaning it’s done well) is probably why I haven’t pointed it out yet. But in all seriousness, the dialogue just flows from page to page, chapter to chapter, and book to book. He’s able to perfectly capture what a real conversation is like and make it feel like you’re just a fly on the wall. It’s a rare and great thing to have in a book. Phipps nails it. 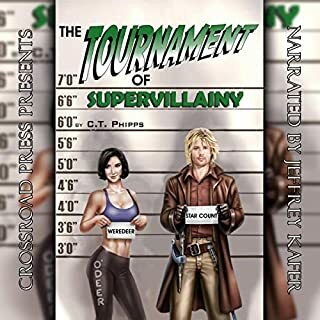 Overall, as I said above, I believe that Science of Supervillainy is now my favorite book in this series. If you’ve loved the first three and also love witty banter, pop culture references, and antiheroes – then this book and series are for you. So, I don’t get to say this often. And I definitely don’t get to say it in books under 200 pages but the science and the description of the disease/issue was spot on and well thought out. Fawkes was able to, in only a few pages, describe what happened before, during, and after the introduction of the main downfall of our society. It wasn’t overly detailed and there weren’t a hundred pages of life before or life during. Fawkes basically says “this is what happened, there were some of the issues it caused, and this is society since then” and does it gracefully and enough that I was satisfied. Most of the story after that introduction follows one man’s attempts at trying to survive. He starts in a survivor camp but quickly realizes that they’ve basically been left for dead and decides to bug out (obviously very very late) to his dad’s camp. Ironically his dad was one of those “crazy prepper types who thought the world was going to end”. Of course, there are some scenes where Bradley jokes/talks about how he’s still shocked how his dad was right. We have the typical bad apples along the way who want to take Bradley’s food and leave him for dead. We also run into (what I would call) the typical female counterpart for our young and very nice Bradley. What I didn’t expect were some of the scenes after that. I won’t ruin the surprise, but know that Fawkes doesn’t follow the typical Post-Apocalyptic “meet and we’re instantly in love” or any other trope that you’re used to. There were numerous scenes (including her and others I won’t mention) that genuinely shocked and surprised me. That doesn’t happen too often in Post-Apocalyptic books anymore. 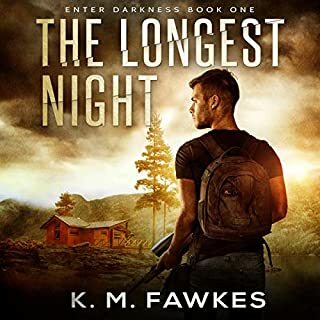 Overall, The Longest Night was a good start to the story. I don’t say this often, but probably could have been combined with book two to make a slightly normal sized novel – but I’m glad that I got to enjoy this bite-sized PA book quickly. I believe that I saw that ABW signed on to do more books in this series and I’m glad. He was able to portray Bradley perfectly. It was one of those perfect voices for the character books. First and foremost, holy crap was this book funny. Seriously, this might be one of the funniest books I’ve ever read. Robinson wrote a perfectly timed book that included pretty much everything that we’re mad or happy about in later 2018 and early 2019. The premise: Space Force (you know, the branch of the military that Trump made to fight aliens) is being disbanded. They’re a joke and were where all the misfits of the other military branches were sent as punishment. Right when this happens – aliens attack and force military bases to fight in a real battle royale and the last man or alien standing wins (wins what?). These aliens (I refuse to ruin the first scene where they see them. I had to pause the d**n audiobook I was laughing so hard) learned about us through video games. So, this is what life has become. The book itself will not be for everyone. Robinson knew that when he wrote it. But I promise you, if you are unhappy with our orange leader or think that all things related to him are ridiculous I would be shocked if you didn’t like this book. Now if you happen to sport a red hat and think that by hating other cultures and people we’re making ourselves better… steer clear. Now that the MAGA wearers have left the review, know that this seriously was a well-written book. Robinson goes meta at one point talking about himself (but kind of not at the same time). The lines leading up to it where he describes how this author just keeps going and never gives you a break between chapters and then ENDS THE CHAPTER was just absolute brilliance. Space Force is all of the things you like about SNL skits, parody movies like Space Balls, and the perfect reminder that other people think things are as ridiculous as you do. Bravo Jeremy Robinson, Bravo. The characters are well explained and thought out. The main two were Halle and Ethan and they were perfect. Ethan was the snarky one who always had something to say and Halle was the quieter one who got stuff done while Ethan was making his jokes. The other tertiary characters were so good. The bus driver might even top Ethan and Halle for my favorite character. She was absolutely amazing. There were obvious and borderline offensive stereotypes written into Space Force, but I only say borderline because they were so funny I almost felt guilty laughing. Easily the funniest was the scene involving the Canadian Special Forces. I won’t ruin that either, sorry. There is something about a snarky book and character that just mends itself perfectly to Jeffrey Kafer’s voice. He’s able to play into the snark and the sarcasm so well. This isn’t the first book, nor is it even the tenth book that I’ve read where gets the narrate a smarta** but know he’s the perfect man for the job. I believe that Emily Woo Zeller did Halle’s narration and absolutely crushes it. Machelle Williams didn’t do too much, but was the perfect finishing touch to this audiobook. I could go on and on about this book and get deeper and deeper into all the reasons that I liked it, but know that it’s easily the funniest book I’ve read this year. 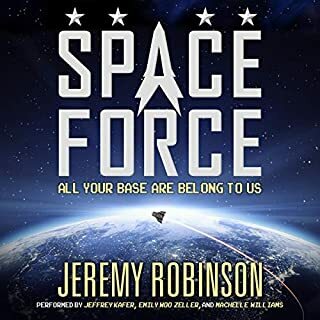 I do hope we get another Space Force book! I requested a copy of this audiobook - it has not affected my views in any way.